THE INTERNATIONAL TRAIN leaving Antofagasta. The Antofagasta (Chile) and Bolivia railway system links the Chilian port of Antofagasta with Western Bolivia, the Argentine, and with Peru. NO railway journey in the world could present more astonishing contrasts than that which takes the traveller across the South American continent from Buenos Aires to Valparaiso. For hundreds of miles over the rolling pampas of Argentina not a single hill is to be seen - nothing but waving grain and luxuriant pasture as far as the eye can reach. So little difficulty has railway building given to the engineers that for 175 miles - from Vedia to Mackenna - the rails of the Buenos Aires and Pacific main line run dead straight and practically dead level. Gradually, however, the line is rising, although at Mackenna, 236 miles out of the Argentine capital, the level attained is only 774 ft above the sea. The great plain, green and brown in colour, stretches away to the horizon. Clusters of trees round the estancias, or farms, and herds of cattle, driven by swarthy gauchos, are the only relief to the monotony of the scenery. Cattle-raising and wheat-growing are the preoccupations of the estancieros. The rise of the line begins slowly to grow more perceptible, but as yet giving no hint as to what lies ahead. On reaching Villa Mercedes, 428 miles from the capital, the train has risen to 1,683 ft above the sea. In the province of San Luis, immediately beyond, hills begin to appear. But not until we are approaching Mendoza do we notice that far off to the west there is rising, as it seems, sheer out of the plain the vast mountain barrier that runs the whole length of the South American continent, the great chain of the Andes. Well may so immense an obstacle as this have held up the railway builders who desired to link up the railway systems of Argentina and Chile. For many years there had existed a rough trail, following the bends of the Mendoza River through winding valleys and rocky gorges, fording turbulent glacier-fed streams, over the wind-swept pass of Cumbre, and down the gorge of the Aconcagua River, along the brink of dizzy precipices, under overhanging cliffs, zigzagging sharply downwards, until at length the Pacific coast was readied. This trail led over a summit of more than thirteen thousand feet above the sea. How could a railway ever hope to achieve the same feat? But better communication became imperative. The fertile country round Mendoza - one huge vineyard which annually makes four million barrels of wine - needed an outlet to the Pacific coast, but little over 200 miles away, as compared with 650 miles to the Atlantic. The track over the Andes was improved, and post services were organized which by the “eighties” had brought Mendoza within four days of Valparaiso. But they were still four days of hard travel, part of the way in coaches, and the remainder, over the 13,000 ft summit, on mule-back, with primitive and inadequate rest-houses at the end of each stage where the nights had to be spent. As far back as 1854 railway communication had been proposed by a man named Wheelwright, who had been responsible for building the first railway in South America, between the towns of Caldera and Copiapo, in Chile. But he was regarded as a visionary, and no interest was taken in his idea. In 1869 the brothers Clark, who had conducted a survey for an inter-national telegraph line between Argentina and Chile, also became convinced that their route by way of Juncal and Uspallata could be made to serve railway purposes. So they decided, in 1872, to submit a scheme to the two Governments, and were successful. Argentina granted the necessary concession in 1873 and Chile in 1874. Owing to financial difficulties - construction through such country was bound to be extremely costly - it was a long time before work began. Not until 1887 did the engineers get to work on the Argentine side, and two years later on the Chilian; the first seventeen miles on the Chilian side were opened for traffic in 1893. Then followed a complete suspension of work. The total length of line to be built, to connect the Buenos Aires and Pacific Railway at Mendoza with the Chilian State Railways at Los Andes, was 154 miles. THE RAILWAYS OF SOUTH AMERICA, which have conquered the barrier of the Andes, are shown on this map. At last, in 1896, a new company was formed in London, called the Transandine Construction Company, and a concession was obtained from the Chilian Government to purchase the section of line already built, and to carry the remainder through to completion. 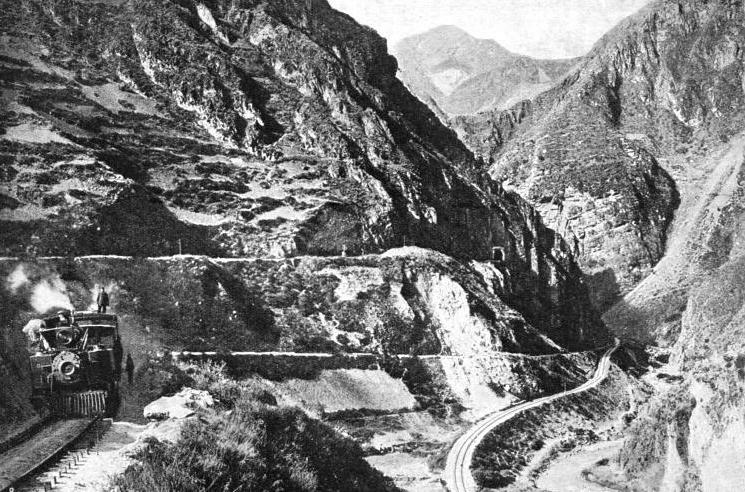 The railhead advanced rapidly; the section from Los Andes up to Juncal was opened for traffic in 1906, the next stretch up to Portillo in 1908. A tunnel was bored through the crest of the Cumbre ridge, 2,600 ft below the pass, but 10,450 ft above sea level and just under two miles long. Then the Chilian and Argentine sections were linked, and the Transandine Railway, a triumph of railway engineering, was opened throughout its length. 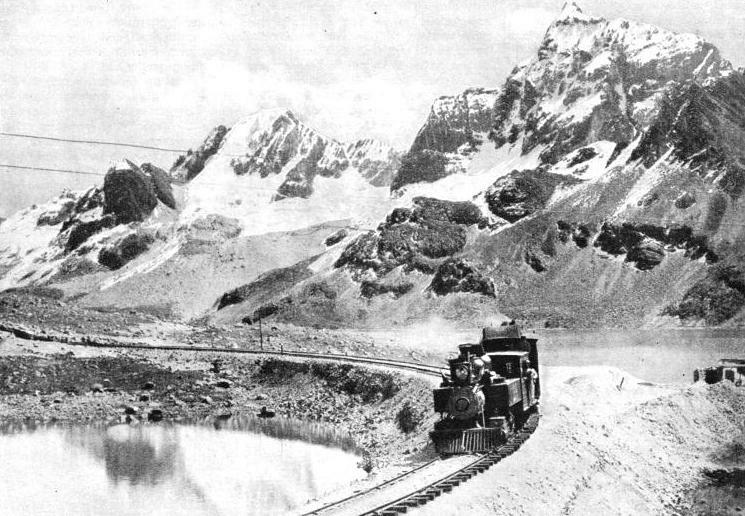 It is not so much the height attained on the journey that makes the Transandine Railway remarkable; ten thousand feet up is remarkable enough, but, further to the north, in Peru and Bolivia, railways pursue their lengthy courses at well above that figure, and at least five railway summits exceed the 15,000 ft mark. The outstanding feature of the engineering of the Transandine line is the extreme rapidity with which the summit level is attained. At Mendoza it is necessary to change trains. The Buenos Aires and Pacific Railway has brought us across Argentina in the spacious rolling-stock possible on the wide Argentine gauge of 5 ft 6-in. For the transit of the Andes the gauge has been reduced to three-fifths of that figure - a gauge of one metre. Notwithstanding this limitation, and the arduous grades to be surmounted, the Transandine Railway authorities provide a wonderfully comfortable deluxe train of six coaches - three of them saloon cars with long observation windows, and furnished with armchairs, a restaurant car, a kitchen car, and a baggage car. A powerful tank locomotive is at the head of the train. It is equipped for rack-and-pinion working, as well as ordinary propulsion by adhesion - a sign of the severity of the inclinations over which the train is to pass before the summit level has been surmounted. Leaving Mendoza, the train makes directly for the foothills of the Andes, and passes for twelve miles through the fertile Mendoza valley. This fertility seems strange at first, because the country on this side of the Andes is practically rainless. But the melted waters of glaciers come pouring down the Mendoza river, and careful irrigation on an extensive scale is responsible for this verdure. This garden at the foot of the Andes is itself 2,470 ft above sea-level. The leaves and fruit of the vineyards are a delight to the eye which will be remembered when the train has climbed to the barren heights. Directly the railway finds the gorge in the mountain wall by which it is to penetrate deep into the heart of the range, the verdure is left behind. Little except bare rock will be seen for many miles, save where it is overlaid, at the higher altitudes, with snow and ice, and the occasional appearance of scrub and stunted trees on the lower mountain slopes. Yet the scenery is one of constantly increasing magnificence, in which distance and the dignity of the great peaks play their part equally. At Cacheuta, twenty-three miles from Mendoza, the line has already climbed 1,600 ft. Here are thermal and sulphur springs, and a fine hotel which, in common with the railway, suffered from some most unwelcome attentions by Nature in the early part of 1934. High up in an inaccessible and almost unknown valley of the Andes - the facts were verified by a reconn-aissance from the air afterwards - a great glacier burst, and made a huge dam across the valley, behind which there accumulated an immense lake. At length the pressure of the water on the wall of ice became greater than this natural dam could hold back. Bursting, it let loose a terrific wall of water which rushed into the gorge of the Mendoza river, where the torrent carried all before it. Miles of the railway were wiped out. Massive steel bridges were wrenched from their bed-plates and carried away like corks, in some cases to be deposited a mile or more from their original locations. The hotel and baths of Cacheuta were similarly overwhelmed. Months elapsed before the railway could once again carry the trains; over certain sections complete reconstruction was necessary. There are times, too, when earthquake and fire as well as flood trouble the railway in this part of the world. Active volcanoes are found in the main chain of the Andes not far away from the route; and the liability to disastrous earthquakes down the whole length of the narrow strip of country between the Andes and the Pacific coast is well known. The journey arouses all the sensations associated with the conquering of an untamed world. Upwards and onwards the train travels, crossing and re-crossing the Mendoza so as to negotiate the turns and twists of the valley among the mountains. Thirty-three miles from Cacheuta we come out into the broad plain of Uspallata, set in the heart of the mountains 5,630 ft above the sea. To the west rises the mountain barrier, ever increasing in height, snow-capped and cloud-wreathed. Nature’s disintegrating work is seen in the vast slopes of detritus at the foot of every mountain slope; there is no vegetation to affect this constant process of erosion, or to cover up its results. AMONG THE SNOW-CAPPED PEAKS of the Andes the track of the Central Railway of Peru attains the amazing height of 15,806 ft above sea-level on the branch line between Ticlio and Morococha, a stretch of which is seen here. Still the railway climbs steadily. The maximum gradient on the adhesion section is limited to 1 in 40, but that is quite steep enough for our panting locomotive. The line twists and turns, arduously, cautiously. Suddenly there appears ahead a rock-strewn ridge, apparently barring the way; but the engineers have found a path. Crossing the abyss, high above the rushing waters of the river, and utilizing a ledge blasted out on the side of the gorge, they have laid their track under the very nose of the obstacle. The ledge widens and the climb to Las Vacas has been achieved. At length the greatest giants of the Andes come into view. It is from Las Vacas, up a lateral valley, that we catch sight of Tupungato, rearing its snowy head to a height of 21,550 ft; and just beyond Puente del Inca there comes into view the greatest of all the mountains in the Western Hemisphere, Aconcagua, whose proud summit, 23,080 ft above the level of the sea, falls short of Everest by only a little over six thousand feet. At Puente del Inca Nature also has some engineering work of note to display. This is the bridge, or puente, from which the railway station takes its name. A natural and not an artificial wonder, this arch of stone clears the gorge of the Cuevas with a span of 70 ft and a width of 90 ft, 65 ft in height above the water. The level of the railway, at exactly one hundred miles from Mendoza, has now risen to 8,915 ft above the sea. Steeper climbing lies ahead, and the steel track now appears intermittently between the ordinary running rails, for the making of the steeper ascents. Leaving Puente del Inca, the train mounts the Paramillo de los Horcones, the Paramillo itself being the moraine of an immense glacier that existed in prehistoric times. Swinging across the Horcones river by a fine steel bridge, the track enters the narrow gorge of the Cuevas, where rack-and-pinion working is more continuous. At its steepest the gradient increases to 1 in 16. So we are brought up to Las Cuevas, 108 miles from Mendoza, and 10,338 ft in altitude. The arduous labours of the locomotive are at an end. In this distance of just over a hundred miles it has lifted our train through a difference in level of just under 8,000 ft. The mountains now close in ahead of the line, higher than ever. Steeply up from Las Cuevas rises the old post track, now a motor road, finding the lowest possible level for crossing the crest of the ridge at the Cumbre Pass, 12,796 ft above the sea. Here is found the boundary between Argentina and Chile, with the great bronze figure of Christ and below it the inscription: “Sooner shall these mountains crumble into dust than the people of Argentina and Chile break the peace which they have sworn to maintain at the feet of Christ the Redeemer”. But the railway traveller sees nothing of this unique boundary post, except a distant peep, right on the skyline, from the western end of the tunnel. For his train is thousands of feet below, in the heart of the rock, being carried through from one watershed to the other by the Cumbre Tunnel, which is but 90 yards short of two miles long. The crossing of the frontier is, however, made audible by the clanging of the bell which the train passes in the middle of the tunnel. THE HIGHEST STATION IN THE WORLD on a standard gauge railway is at Ticlio, 15,610 ft above sea-level, in Peru, on the Pacific side of the Andes. On the approach line to Ticlio eight tunnels were necessary in a stretch of less than two miles. We emerge from the tunnel on the Chilian side at Caracoles. Ahead of us the valley drops profoundly, and we see wide sweeps of the line far below, over which presently we shall be travelling. 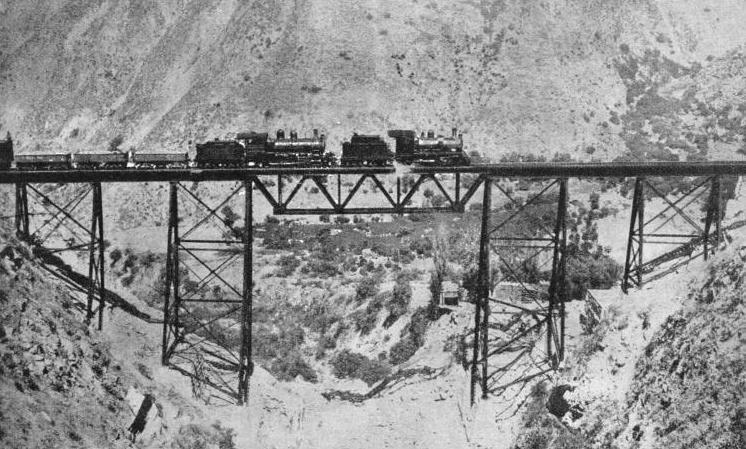 The greatest difficulties were experienced in the engineering of the next section of the line westwards, owing to the fact that the Pacific slope of the Andes is so much steeper than the eastern slope. In no more than forty-four miles, from Caracoles to Los Andes, the line must descend 7,615 ft, down the gorge of the Aconcagua river. Between Caracoles and Portillo is some of the grandest rock scenery in the world, and on this side of the Andes diversified by vegetation, growing more and more luxuriant as we descend. The railway line curves and twists on itself, by means of some remarkable spiral location work. Rack-and-pinion is freely used, and at as steep an inclination as 1 in 12½, one stretch of which is nearly a mile in length; 1 in 40 is again the ruling gradient, but in much longer continuous sections; while the tunnels on the Chilian side add up to a total length of 4,600 metres, which is nearly twice the length of tunnelling on the Argentinian side. 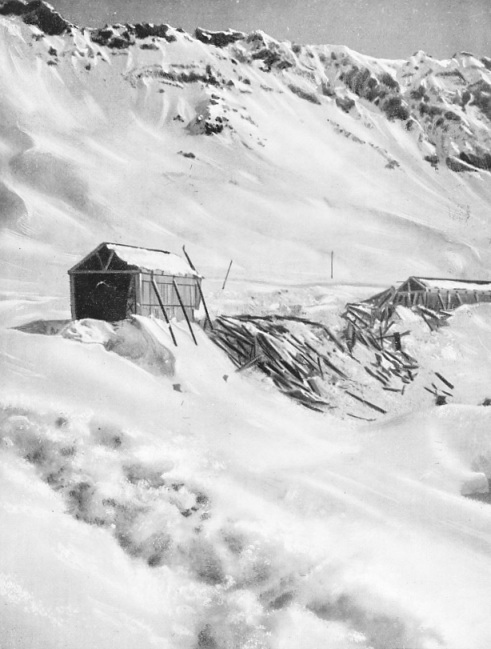 In 1922, to provide better protection against avalanches, many massive masonry shelters were put in hand, and these have added 3,000 metres to the total amount of tunnelling on the line. To speed up the working over these steep inclin-ations between Caracoles and Los Andes, steam has now given place to electricity. A powerful articulated electric locomotive of the 1-C-C-1 type - with two groups of six-coupled driving wheels, and a pair of carrying wheels at each of the two outer ends - takes charge of the train. Considering the steepness of the descent the travelling is remarkably fast, as with a train of 150 tons weight the electric locomotives, using the rack, are able ever to mount the 1 in 12½ gradient at 9½ miles an hour. The six coaches of our luxury train from Mendoza to Los Andes fall comfortably within the 150-ton limit. On the rack section the electric locomotives exert a tractive effort of 22,500 kilogrammes and on the adhesion sections a maximum of 10,500 kilo-grammes. Current is supplied from large hydro-electric plants near Santiago, and is at a pressure of 44,000 volts, 3-phase, 50 cycles. DEVASTATED. Snow-sheds must be built to protect many sections of the line that cross the formidable barrier of the Andes. But Nature sometimes gains a victory in her fight against the forces of civilization, and this photograph shows over sixty yards of snow-shedding destroyed by an avalanche in 1921. Just before Portillo the train skirts the Inca Lake, set among the mountains at a level of over 9,000 ft - a mysterious sheet of water the contents of which never increase nor decrease in quantity. The valley below Portillo is framed with mountains of almost indescribable beauty and majesty, rising sheer from the floor of the valley to the sky, one behind the other, from fertility at the lower levels to snow-draped summits of vast height. And so, ever down-wards, we travel through Juncal and across the extraordinary chasm of the Aconcagua River at Salto del Soldado - the “Soldier's Leap” - until Los Andes is reached. Here the narrow-gauge journey is at an end, and we change into one of the trains of the Chilian State Railways, on a gauge of 5 ft 6-in, like that of Argentina. Our metre-gauge train, which started its journey at Mendoza, 2,518 ft above sea-level, has carried us up to a maximum height of 10,452 ft in the Cumbre Tunnel, and has then dropped us to 2,669 ft at Los Andes. From Los Andes the journey is swiftly made down to Valparaiso, no more than eighty-two miles distant; electric haulage is again provided. Our first introduction to the Pacific is at the popular seaside resort of Vina del Mar - the Brighton of Valparaiso - and a few miles farther the city of Valparaiso is reached. The total length of the journey, from Buenos Aires has been 888 miles; it has occupied a day and a night as far as Mendoza, and another whole day for the 238 miles threading the Andes from Mendoza to Valparaiso. B y changing at Llai-Llai, we may turn southwards for Santiago. Santiago and Llai-Llai are both stations on the remarkable longitudinal main line of the Chilian State Railways, which, starting at Puerto Montt in the south, travels the whole length of this curiously shaped country, on the slope between the Andes and the Pacific, for a distance of no less than 2,750 miles, to Pintados in the north. Between Puerto Montt and Calera, the junction for Valparaiso, the gauge of 5 ft 6-in is in use, but north of that point the gauge contracts to one metre. No country, with the possible exception of Norway, could have so strange a configuration as Chile, nearly 3,000 miles long, yet nowhere wider than 180 miles, and in places dwindling to a width of sixty miles only - and full of railway problems. ZIGZAGGING TO GAIN HEIGHT, the Central Railway of Peru winds its way through the Rimac Gorge on the Callao-Oroya route. Passenger trains on this line are run three times a week. As we travel northwards through Chile, the character of the country changes. In the south there is much forest land; in the centre, assisted by irrigation, the land is largely arable; in the north it becomes a desert region. But it is in the arid north that the wealth of Chile largely lies. For it is here that there are the great nitrate deposits, and high up in the Andes other minerals, copper and silver in particular, exist in immense quantities. It is in search of these minerals that railways have been laid on “the roof of the world”. Travelling north by the longitudinal trunk of the Chilian State Railways, we intersect, at Baquedano, the first of a series of railways which start at sea level on the Pacific coast, two in Chile and two more in Peru, climb, in a couple of hundred miles or less, to heights of 13,000 ft and more, and drop down into lofty valleys in the heart of the great chain of the Andes. In two instances a lake is reached on which there plies a railway steamer service, over a route 120 miles in length, the whole of which is 12,500 feet above the sea. The railway thus intersected at Baquedano is the Antofagasta (Chile) and Bolivia Railway. It is in a veritable desert that the two lines meet. This is the centre of the great nitrate country, where no rain falls. and not a blade of grass is to be seen for many miles; all the water has to be brought from long distances, and the only signs of life are at the colonies which surround the nitrate factories. FOR MOUNTAIN SERVICE. This British-built tank locomotive operates on the Antofagasta (Chile) and Bolivia Railway. It was built for oil fuel, working with a capacity of 1,478 gallons of fuel. The coupled wheels are 3 ft 8 in diameter, the diameter of the cylinders is 19 in, and the stroke is 24 in. The working pressure is 180 lb per sq in. LAUNCHING A SHIP ON TOP OF THE ANDES. 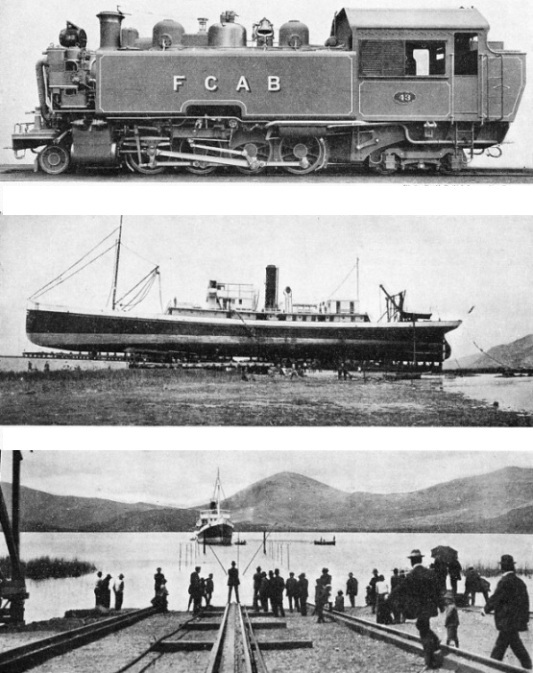 The railway company operates a steamer service across Lake Titicaca. The photograph shows the launch of the Inca. This ship was built in Hull, sailed to South America, and was then transported in parts to be reassembled on the lake. AFTER THE LAUNCH. The Inca on Lake Titicaca, 12,500 ft above sea-level. The steamer’s journey across the lake to connect up the railway is 120 miles long. It was in 1873 that the first stretch of line was begun from Antofagasta inland, to bring nitrate down to the coast for ship-ment. To-day the Antofagasta Railway controls 1,821 miles of line, including a main trunk line through the heart of the Andes to La Paz, the capital of Bolivia, 729 miles away. The international trains over this route, connecting Peru with Bolivia, and also with the Argentine by the recently constructed route down from Uyuni to La Quiaca, where connexion is made with the North Central section of the Argentine State Railways, include restaurant and sleeping cars and every modern luxury. When the track of the Antofagasta Railway first began to find its way up into the mountains, it was on the extremely narrow gauge of 2 ft 6-in, on which, nevertheless, the locomotives and rolling stock were developed to a size which astonished all those who travelled over the line. 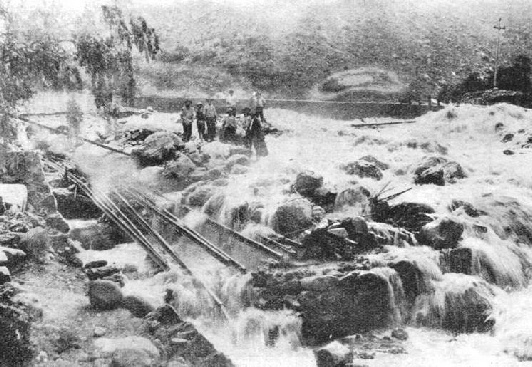 As the Antofagasta authorities gradually assumed control over the railways in the highlands of Bolivia which were all of metre gauge, as well as of the northern end of the metre-gauge Chilian long-itudinal railway, the difference in gauge proved so troublesome that eventually the decision was reached to widen all the 2 ft 6-in gauge lines to metre gauge. 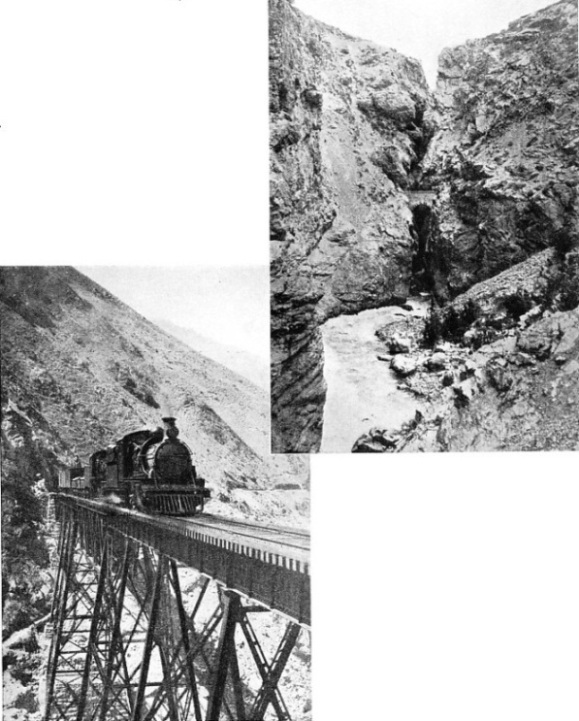 REMARKABLE ENGINEERING FEATS were accomplished when bridges were wedged between cliffs so that the Transandine Railway could be carried over mountain torrents. This picture shows the bridge at the “Soldier’s Leap”, almost dwarfed by the cliffs. ANOTHER ENGINEERING TRIUMPH. The Challape Bridge, near Matucana, on the Callao-Oroya route. The bridge, built in 1909, has ten spans and a total length of 356 ft. This herculean task required immense preparations, for it was not possible to stop the traffic while conversion took place. In the company’s workshops at Mejillones 61 locomotives, 103 coaches and 2,140 wagons had to be reconstructed for the wider track - in itself a costly job. Mixed gauge had already been laid over certain sections, that is, both 2 ft 6-in and metre; and the final operation, for which the main line was closed for six days in July, 1928, was that of converting the gauge over 180 miles of line, which, despite the waterless and chiefly uninhabited country, mostly at between 10,000 and 13,000 ft altitude, was successfully accomplished in this amazingly short time. Some of the steepest climbing, partly at 1 in 30, is immediately after the start from Anto-fagasta. In the first eighteen miles the line has already climbed 1,820 ft; on reaching the junction at Baquedano, fifty miles in, it is 3,380 ft up. For nearly a hundred miles farther the arid nitrate lands are traversed, at steadily increasing altitudes, till the town of Calama is reached, 149 miles from Antofagasta. From the nitrate region we now pass to that of copper. The Antofagasta Railway has handled up to a million tons of the former commodity in a single year; up a short branch just beyond Calama are the mines and smelting plant of the Anaconda Copper Company, which can deal with some 40,000 tons of ore and produce 600 tons of pure copper in a day. At San Pedro, 197 miles from the start, are the great reservoirs, blasted out of solid rock, of the waterworks which supplies the city of Antofagasta, the nitrate fields, and all the railway stations up the line in this waterless country. Nearly £2,000,000 was spent by the railway on this project alone, and including the pipe lines from the mountains to the reservoirs, the water travels 235 miles in all from the source to Antofagasta. We have now turned the 10,000 ft level, and presently the railway cuts through a lava bed over a quarter of a mile wide - a reminder that the two great mountains St. Pedro and St. Pablo, here skirted by the line, are both volcanoes, one of them partly active. Still climbing, we reach the summit level of the Chilian section of the line at Ascotan, 12,976 ft above the sea, attained without any help from rack and pinion or other similar devices. The sharpest curves are of about 400 ft radius. A little farther on, the railway skirts a lake, twenty-four miles long, winding at the same time round the lower slopes of snow-capped mountains the flanks of which are brilliant with all kinds of metallic hues - a weird scene indeed. But most astonishing of all, perhaps, is that after the line has ascended to the 12,000-ft level, near Ascotan, it never drops below this altitude for more than five hundred miles! AT HIGH ALTITUDES the railway is exposed to the ravages of the cyclone. 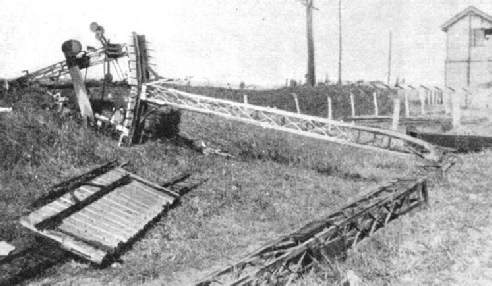 This illustration shows the effect of a storm on a signal standard on the Transandine Railway. From Ollague, 274 miles from Antofagasta, a branch is thrown off in a westerly direction to reach the rich copper mines at Collahuassi. Near Montt it reaches an altitude of 15,817 ft - practically equal in level to the top of Mont Blanc, and the highest railway summit in the world. This is the only branch of the Antofagasta line on which snow gives any serious difficulties. For we are now so near to the Equator that even at 15,000 ft the line is free from snow over a great part of the year. Proceeding from Ollague we cross into Bolivia and reach the important junction of Uyuni, where the line from Argentina, previously referred to, comes in from the south-east. As far as Atocha it belongs to the Bolivian Government. A SEVERE LANDSLIDE, which caused the Purhuay river to change its course in 1925 and flood the lines of the railway in Central Peru, caused a prolonged stoppage of traffic. At Rio Mulato, 448 miles from Antofagasta, a branch is thrown off to the ancient city of Potosi - another line of airy aspirations. At Condor the altitude is 15,705 ft. In this broken, wind-swept, and often snow-covered area of Bolivia, construction was very difficult, but the 108 miles of line between Rio Mulato and Potosi were successfully built, and the line has since been extended for 175 miles to Sucre, the political capital of the country. 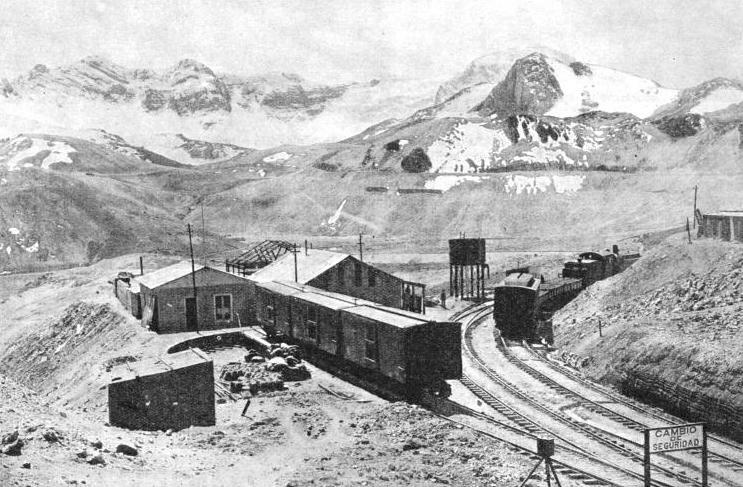 The Bolivian section of the Antofagasta line now passes through many tin-mining settlements, by way of the town of Oruro to Viacha, which has humorously been called the “Crewe” of Bolivia, although little more than a train-shed in wild and open country. For it is the meeting-place between several railways. From the Pacific coast there has climbed the Arica-La Paz Railway, over a summit 13,963 ft high at Jeneral Lagos, and there is also the railway from Guaqui, on Lake Titicaca, to La Paz. The city of La Paz, 12,143 ft above the sea, the virtual capital of Bolivia, has a dramatic rail approach. Continuing the journey, we leave La Paz by the 60-miles line to Guaqui, which forms part of the system of railways operated by the Peruvian Corporation. This has to employ electric power in order to climb out of the depths of the valley, and does so by adhesion on the extraordinarily steep gradient of 1 in 16. By this means the railway climbs 1,500 ft in six miles, with numerous S-curves, to El Alto, overlooking the whole of the La Paz valley, and with a magnificent view. WHERE TRAINS MEET THE CLOUDS. A comparative table of the height of summits reached by the railway. Sixty miles from La Paz we find ourselves on the shores of an inland sea. It seems almost incredible that a body of water of such enormous size can exist at a height of 12,500 ft, but here lies Lake Titicaca, perfectly real, and easily the largest sheet of navigable fresh water in existence at such an altitude. The railway-owned steamer lying alongside the quay at Guaqui sets out on a twelve-hour voyage, 120 miles in length! There are three of these vessels at work, covering an itinerary of some 1,350 miles; the biggest of them, the Inca, driven by twin-screws and triple-expansion steam engines, is a capacious 700-ton craft, 228 ft long and 30 ft in the beam. How she sailed from Hull, where she was built in 1905, to the top of the Andes might well mystify the landsman. In fact, she was carried piecemeal over the railway, and reassembled on the lake. This is surely the most phenomenal voyage that the world has to offer. Leaving the steamer at Puno, we find ourselves on one of the two trunk lines that Peru sends up from her Pacific coastline into the Andes. Both are on the standard 4 ft 8½-in gauge, which makes their engineering through the mountains all the more remarkable. The line running for 326 miles up from Mollendo, on the coast, to Puno, is the Peruvian Southern. First of all it climbs 107 miles to the important and beautiful city of Arequipa, where it has attained 7,500 ft.
A DOUBLE-HEADED FREIGHT TRAIN crossing the slender Challape Bridge. This illustration gives a vivid impression of the barrenness of the mountain country traversed by the Peruvian Central Railway. Arequipa lies at the foot of three snow-capped giants of the Andes, Chachani, Misti, and Pichu-Pichu, all between 20,000 and 18,150 ft high; circling their western flanks, the railway makes its way through the heart of the western Cordillera, finding its summit level at Crucero Alto, 14,666 ft up. From here falling grades, for the most part, ensue to Juliaca, 30 miles from Puno, where an important branch diverges to the north-west. It leads for 210 miles to Cuzco, the Inca capital of historic memories. Crossing the eastern Cordillera of the Andes at La Raya, 14,153 ft. above the sea, this railway descends into the great watershed of the Amazon, and finishes at the comparatively modest altitude of 11,000 ft. But the most remarkable of all the railways in the Andes is the one the description of which has been reserved until last. It is the Peruvian Central, which starts its course at Callao, on the Pacific coast, and in no more than 172 miles has climbed to the astonishing altitude of 15,604 ft at the Galera Tunnel. Of this ascent, 12,873 ft are crowded into the 118 miles from Chosica to the summit, which works out at an unbroken average of 1 in 48½. So rapid is the rise that it is necessary for the railway company to carry cylinders of oxygen in the trains, for the relief of passengers who may suffer from mountain sickness. The steepest of the gradients on the Peruvian Central reach the very considerable inclination of 1 in 25, often for long distances together. Even then the only possible way of getting up the precipitous valleys on this side of the Andes is by means of zigzagging to and fro on the mountain-sides, with a succession of reversing stations at the elbow of each zigzag. Up these zigzags the engine alternately pushes and pulls its load, till the summits are reached. There are altogether twenty-one zigzags on the line. Of bridges thrown across lateral gorges there are some amazing examples. Of these the most outstanding is Verrugas, which has a height of 252 ft above the chasm that it spans, and is 575 ft long. It is of a double cantilever type, supported on two trestle towers of steel, and replaced a previous structure that was washed away after a cloudburst. Ten miles farther up the line is the great Challape steel viaduct, also carried on spidery steel trestles. Longer still is Chaupichaca Viaduct, of a similar type, but 426 ft long, and including two very large lattice girder spans. At last the train reaches Ticlio, which, at an altitude of 15,610 ft, is the highest station on any standard gauge railway in the world. Shortly afterwards it passes into Galera Tunnel, the highest point in which is 15,694 ft above sea level. The tunnel is 3,860 ft long. From Ticlio the Marococha loop travels even higher, reaching at La Cima the record altitude for the standard gauge of 15,806 ft. This is the second highest railway summit in any part of the world. Descending to Oroya, the Peruvian Central continues to Jauja and Huancayo, 346 miles from Callao, the last fifty miles, all at between 10,000 and 11,000 ft in altitude, being the finest wheat-producing district in Peru. 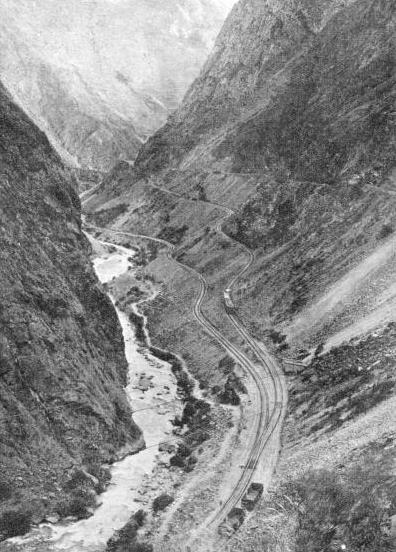 THE CACRAY ZIGZAG on the Central Railway of Peru. Piercing the sides of the mountains, and twisting and turning in great ravines, the train carries the passenger to some of the most lofty stretches of line in the world. You can read more on “By Rail in the Argentine”, “Main Lines of Brazil” and “The Trains of Uruguay” on this website. You can read “Across the Andes” in Wonders of World Engineering.